Arthur is experimenting with larger boxes. he feels he should make allowances for growing-space in case he is unexpectedly larger. Two days ago both his front paws were unexpectedly larger to the extent that he appeared to be wearing two orange boxing gloves. This did not seem to concern him much, and he was therefore very put out when he was whisked off to the vets and had a trying day in which humans intervened with a lot of prodding and a sharp pointy injection and wouldn’t let him come home until he had normal paws again. He feels therefore that one should always be prepared for the unexpected: perhaps the humans believed he wouldn’t fit into any boxes with big paws. Incidentally, Arthur is not revealing what it was that made his paws much too big, we think he may have experimentally stood in some interesting insects. 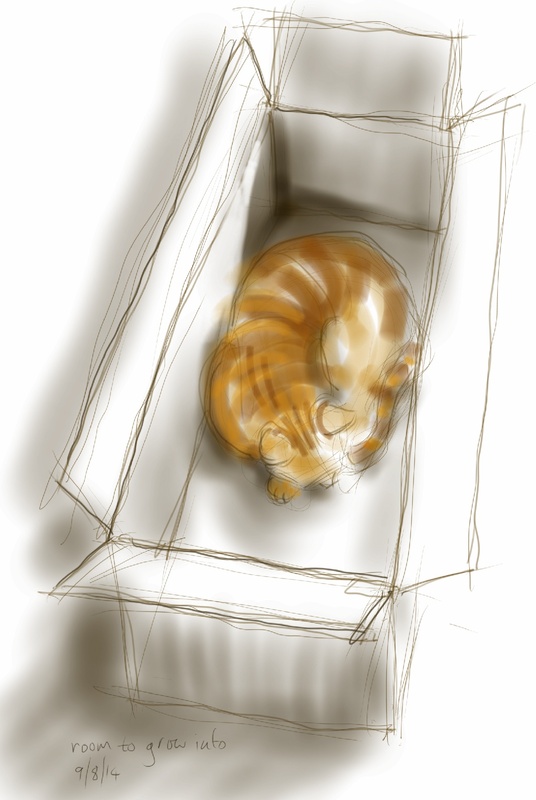 This entry was posted in Cats and tagged art, arthur cat, cardboard box, cat, cat drawing, cat sleeping, cat-of-the-day, drawing, illustration, life drawing on August 9, 2014 by Nancy Farmer. Poor Arthur (and poor you). I wonder what did happen to his paws? I will pass on your sympathies 😉 his feet looked dreadful but he was far more upset at having to go to the vet! LOL! not sure Arthur is so easily convinced but it’s worth a try! So…..Interesting Insect drawings of the fertile imagination of Nancy Farmer, Insect Artist, to be expected Coming Soon? I do hope so…..